I appreciate the friendliness of the staff, and the late afternoon appointment. The experience was very efficient fromstart to finish. I will definitely be back! 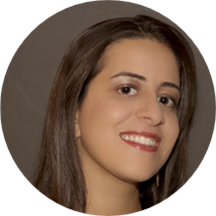 Dr. Hiba Zakhour grew up in Fairfax County and received her degree of Bachelor of Science from the College of William and Mary in Williamsburg, VA. In 2012, Dr. Zakhour received her degree of Doctor of Dental Surgery from Howard University. As a dental student, she volunteered with several organizations such as Give Kids A Smile and participated in oral cancer walks. Dr. Zakhour continued to pursue her passion for dentistry by joining a general practice residency program at Coler-Goldwater Hospital in New York City, where she received training in several areas of cosmetic dentistry including implants, veneers and Invisalign. Dr. Zakhour is a standing member of the American Student Dental Association and the American Dental Association. When she is not practicing dentistry, Dr. Zakhour likes to travel, play sports, and watch movies with her family and friends.